How to work with air-dry clay to get the best results? — Adele Po. The clay itself is very important and the quality of it usually varies. For dolls, my favourites are “La Doll”, “Premier” and “Creative Paperclay”. Also, you can check “Sculpey Model Air Dry” clay or “Hearty White Air Dry Clay”. If you’re worried about price point, I suggest using good quality clay for detailed work like sculpting the face or hands and the cheaper one for the rest of the body. It can get pretty disheartening if the clay doesn’t work in your favour. So save yourself some trouble battling the clay that is stiff or crumbly and get better quality ones. the cracks are less likely to occur. For armature, I usually use 18 gauge wire that’s bendable but strong and holds its shape. The styrofoam comes in handy when I’m shaping larger parts of the doll’s body. Usually, I’m using it for head or torso. Adding the clay on top of the styrofoam saves a lot of clay that otherwise would go wasted filling those large areas. You can get more information about styrofoam in this recent tutorial. 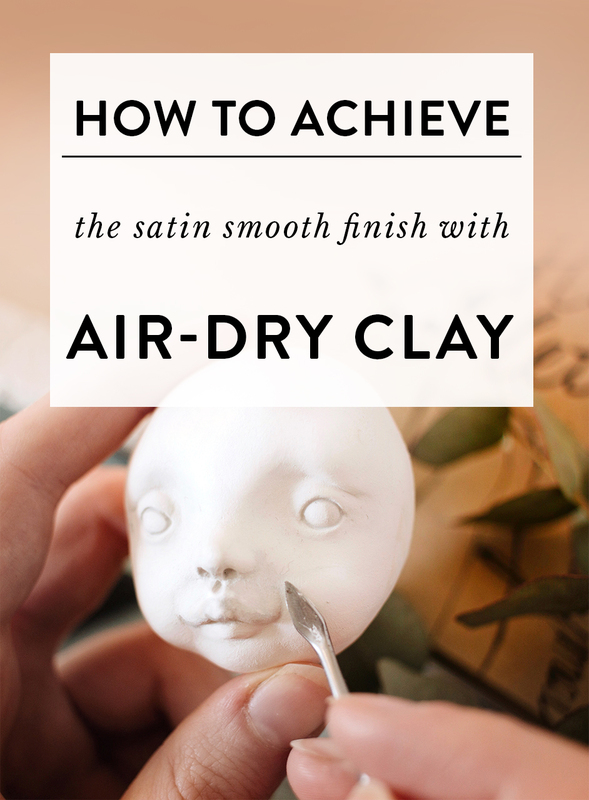 This one is very important when working with air-dry clays. It’s much easier to control, shape and spread the clay when you sculpt in thin layers. Because air-dry clay is water based, you have to keep it moist while sculpting. Have a small jar of clean water and wet the clay, tools or your fingers when adding a new layer. Another important point is to wait for each layer to dry, especially when sculpting small details. I’m very familiar with a calamity of mushing the previous work I did. For example, if you’re sculpting lips, be patient and wait for the upper lip to dry before adding the lower lip. While waiting you can work on other parts of the doll and if you’re doing thin layers, it takes only 20 minutes to dry! Adding the lower lip after the upper lip is completely dry. By the way, all the pencil markings will be sanded and cleaned. I draw a lot to check the symmetry or mark the face features before sculpting. No matter how thoroughly you smooth out the clay it still develops rough texture when completely dried. If it works for your sculptures that’s wonderful! Perfectionist in me strives for the satin smooth finish which can only be achieved by sanding. I usually start with 60-80 grit sanding paper and remove larger bumps and even out rough areas. Then I move on to the fine, 400-800 grit, sandpaper. It works very well in places where you don’t want to lose any detail. Very fine sandpaper polish only the surface of the clay so delicate features of the face stay intact. Patience comes in play once again, sometimes I spend a few hours sanding the doll so be prepared for this long and tedious process. To avoid dust, cover the surfaces around you and wear a mask to protect your lungs! Tip: Fold the sanding paper into a triangle and use the pointy part to sand hard to get places around the eyes, nose or between the fingers. How to strengthen air-dry clay when sculpting delicate parts, for example, fingers? A good trick is to mix PVA glue (white glue, Elmer’s glue) with water and use this mixture instead of clear water while sculpting. When the glue within the clay dries it holds those tiny paper fibres strongly together. The piece will be harder to sand though. Also, to make the clay less likely to break use armature when possible. Even if it’s very thin wire, it’s better than nothing. I use it for fingers so if I break any they don’t fall off entirely and it’s easier to repair the damage. Usually, the clay cracks in the drying process. Air-dry clay shrinks a little bit when drying and if the outside is drying faster than the inside of the sculpture - the surface cracks. You can solve this by sculpting in layers and waiting a little bit for them to dry. If you sculpt in bigger chunks the oven with ventilator might help as well. Set the oven on the lowest setting and keep an eye on your sculpture. The heat can penetrate to the deeper layers and dry it more evenly, because air-dry is porous. How to easily carve air-dry clay? Air-dry clay is very good for that! Actually, most of the detailing I do is by carving. For dry clay carving, make sure that your tools are very sharp. The clay can get crumbly, because of the paper fibres, if you're carving with a blunt scalpel. One of my favourite way is to wet the surface a little bit and then carve with a needle or any other tool. Make sure that your sculpture is completely dry and wet just the top layer of the clay. How to get rid of small fibres when the clay is dry? Usually, air-dry clays are paper-based, that’s why they have such fluffy and lightweight texture. But all those paper fibres get very visible once the clay is dry. To minimise this irritating characteristic choose stone clay, for example, “La Doll” or “Premier”. They still have fibres, but less than usual paper clays. Because air-dry clay is water soluble, coating the surface with water, glues the fibres back to the surface and seals it. It's very important to have soft flat brush so you won't leave any brush marks on the surface. It doesn't matter if you're just starting out with air-dry clays or have been sculpting for years, you probably encountered the nightmare of fluff. What I call fluff is the tiny fibres that are in the composition of clay. I hope this answers some of your questions and worries about air-dry clays! Let me know if you have any more questions in the comments below and I’ll get back to you. Helping other artists is one of my hobbies so don’t hesitate writing me.